AEO sells american casual clothing and accessories. Buy a discounted gift card to save on top of coupons and sales. The gift card works online on AE.com and in-stores. 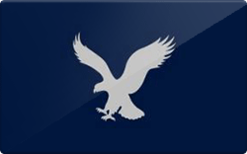 America Eagle Outfitters AEO gift cards also work at Aerie stores.